Mediocrity: the quality of something that is not very good. (Webster’s) This is an accurate characterization of the Carolina Hurricanes’ season thus far. It is also unfortunate. Even before the season began, many pundits predicted such a surge to the bottom. I was not one of those pundits. I truly believed that the Hurricanes had a shot at making the playoffs this season. I went so far as to put that very notion into an article on June 14th, realizing as I wrote that I was standing on an island with very few others. I have stood fast on that island, even though the surge to mediocrity and even worse reared its ugly head in October. The ‘Canes broke out of the gates with untimely injuries, to Jordan Staal, and then others. Most notably Eric Staal, Jeff Skinner, Patrick Dwyer, and Nathan Gerbe all missed time early this season due to injury. That put Carolina in an unfortunate situation early, and the naysayers began to talk 2015 NHL Draft position. What a dismal way to get going under a new Executive VP/General Manger and head coach. But, contrary to the pundits, the start was not the nail in the coffin to the Hurricanes’ season. Cam Ward is not exhibiting any mediocrity (the quality of something that is not very good) at this point. He has been a reliable presence in between the pipes for the Hurricanes this entire month. With absolutely no offense to Anton Khudobin, Ward has raised his game and distinguished himself as the “stud” Coach Bill Peters was looking for at the onset of the season. If “Wardo” continues to bring a consistent level of above-average play every night, the ‘Canes can focus on other areas of their game that needs to stop surging to mediocrity. I do not want to jump on the “let’s bash Semin” bandwagon. He can be a very good player. At times. Unfortunately this season has not been one of those times. Coach Peters made it clear in his introductory press conference that he controlled the ice time, and that this control was an effective way to get the attention of players who were not bringing the effort needed to win. On November 1st, Coach Peters invited Alexander Semin to “have a seat.” Semin watched as his teammates kicked off November with a win at home versus the Arizona Coyotes, followed by a victory over the defending Stanley Cup Champion Los Angeles Kings. The team went from having 2 points the day before, to having 6, tripling their results. 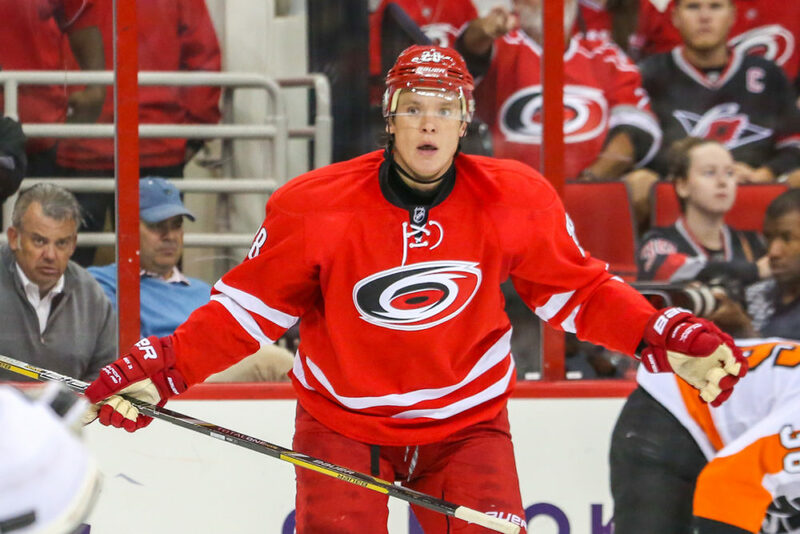 Was the absence of Alexander Semin the key to this early November turnaround? Surely Semin, Eric Staal, and Jeff Skinner would be pieces of the Hurricanes’ playoff-hunt puzzle that we could automatically insert. Wrong. Mediocrity does not begin to accurately characterize the play of Alexander Semin thus far this season. Again, this is unfortunate. The conversation has turned from “will he respond to Coach Peters having benched him,” to “can the ‘Canes move him?” John Forslund, Hurricanes television play-by-play voice for FOX Sports and NBCSN play-by-play talent, is not optimistic. Forslund says he doesn't see anything to believe Semin can turn this around. Which is it? The mediocrity that sometimes gets overshadowed by the spectacular, or the skill that obviously lacks the will? The Hurricanes will have to wade through some tough options if Semin does not get the message soon – provided if, as Forslund fears, it isn’t too late. Deal Alexander Semin or send him down? What! Deal him or send him down? We’re talking about a phenomenal talent here. Who in their right mind would even consider sending him to Charlotte? Trying to trade him, yes, but sending him to the AHL? No way! Apparently is has come to this crossroads. Like John Forslund noted above, there does not seem to be much hope for Semin returning to form as an integral part of Coach Peters’ system. Most recently he was a healthy scratch for the game against the Kings Thursday night. #Canes notes: Alexander Semin will be a healthy scratch tonight. Brad Malone in. Jay Harrison returns on defense. John-Michael Liles out. The ‘Canes lost 3-2. Might they have won with Semin on the ice? Who knows? He did play in the previous game against the Dallas Stars and they won 6-4. Of course, he had no goals or assist and was a -1, so his contribution to the Hurricanes scoring frenzy is questionable. By the way, he has no goals and 5 assists on the season. First, Coach Peters can get his attention and he returns to form, plays hard and contributes to the Hurricanes’ success. Coach Peters is obviously trying to make it happen. #Canes head coach Bill Peters had an extended conversation with Alex Semin as practice was winding down. Now 1-on-1 with Nestrasil. If Semin responds, all is good. The second scenario is that GM Ron Francis tries to trade him. At $7 million per year, with a reputation of laziness, that is unlikely. Third, he gets put on waivers if no other team trades for him and he is suddenly wearing a stylish Charlotte Checkers sweater. If he objected and refused to don the Checkers gear, then the team could cut him loose. He could wind up back in Russia playing for the KHL. If Semin declines being sent to CHA, would be violation of contract. Canes could cut him loose for little money. The bottom line on Alexander Semin is that he is an awesome talent. He is however surging to mediocrity this season, and has put his team in a bad place. 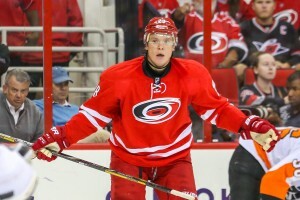 I believe that most Hurricanes fans want to see him on the ice and contributing. Let’s hope that scenario is the one that emerges. I don’t want to be all alone on the island of belief in the ‘Canes chances at being a good team. Alexander Semin, if you’re reading this, please step your game up. Thank you.